DOVER, Del. 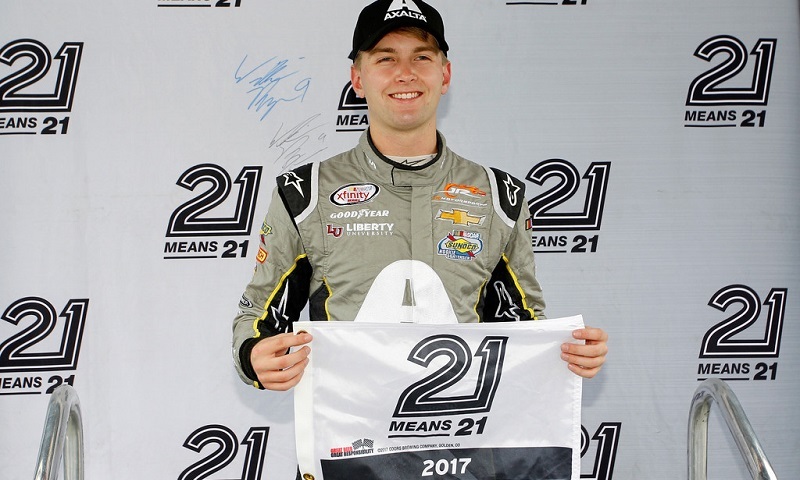 – Looking to get his NASCAR XFINITY Series playoff run back on track after a lackluster run at Kentucky Speedway, William Byron used a clean sweep of Coors Light Pole Qualifying to capture the top spot Saturday at Dover Int’l Speedway. Byron topped all three knockout rounds and posted his fastest time in the final one, touring the one-mile concrete oval in 23.046 seconds (156.209 mph) and putting his No. 9 Axalta Chevrolet out front. The pole-winning effort is the second of the young rookie’s XFINITY career. Byron will be chased to the green flag by a pair of Monster Energy NASCAR Cup Series regulars in Daniel Suarez and Erik Jones, who put Joe Gibbs Racing second and third on the board, respectively. Suarez’s lap of 23.084 seconds (155.952 mph) in the No. 18 Toyota allows him to share the front row with Byron, while Jones lines up on the inside of row two, alongside Byron’s JR Motorsports teammate Justin Allgaier. Kentucky winner Tyler Reddick completed the Fast Five for Chip Ganassi Racing. Cole Custer was the fastest-qualifying Ford in sixth, ahead of Brennan Poole, Ryan Blaney, Daniel Hemric, Elliott Sadler, Ty Dillon and Ross Chastain among the drivers who advanced through all three knockout rounds. Playoff contender Brendan Gaughan was the first driver below the cut line who failed to make the final round, starting 13th (23.392/153.899) in the No. 62 South Point Hotel & Casino Chevrolet. Other playoff drivers eliminated in the second round were Michael Annett (16th), Ryan Reed (17th), Blake Koch (19th), Jeremy Clements (22nd) and Matt Tifft (23rd). A flat tire prevented Tifft from posting a time in the second round and will relegate him to the rear of the field for the start of Saturday afternoon’s race, due to tire changes after qualifying being unapproved adjustments. J.J. Yeley made a second run in the first round, but just was edged out at the end of the 20-minute clock and will start 25th (23.777/151.407) in the No. 14 Toyota for TriStar Motorsports. The ‘Use Your Melon’ Drive Sober 200 kicks off at 2:30 p.m., live on NBCSN, the Motor Racing Network and SiriusXM NASCAR Radio, channel 90.